Vietnamese Prime Minister Nguyen Xuan Phuc suggested the Democratic Party of Korea to continue supporting the Vietnamese and Korean governments to foster trade and economy cooperation, heading to raising the two- way trade turnover of US$ 100 billion by 2020. The suggestion was stressed at the meeting between Vietnamese Prime Minister Nguyen Xuan Phuc and Mr. Lee Hae- chan, Chairman of the Democratic Party of Korea in Hanoi yesterday. Mr. Lee Hae-chan said that he visited Samsung plant in the Northern province of Bac Ninh. Over 10 years for investment into Vietnam, the corporation has operated effectively thanks to supports from the Vietnamese Government. Along with the Korean businesses, the success of Samsung in Vietnam affirmed a strong development of economic cooperation between the two countries. On the same day, PM Nguyen Xuan Phuc met with Mr. Lee Hyo- seong, Chairman of the Korea Communications Commission. Mr. Lee Hyo- seong said that the Korean people had good impression for Vietnam, so he affirmed to make an attempt for a TV channel about Vietnam as soon as possible. 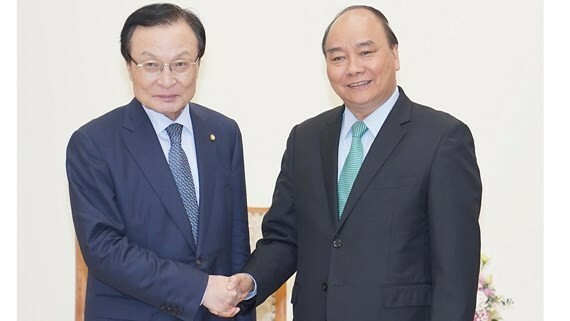 PM Nguyen Xuan Phuc also suggested both sides to strengthen mutual cooperation in producing advertisement shows and programs about Korea via Vietnam’s radio and television channels.